“I shall never write a symphony,” he said when young. But he did, four of them. It took him 14 years to produce his first symphony because he was worried about measuring up to Beethoven. But, no one felt the footsteps of that giant like Brahms did. 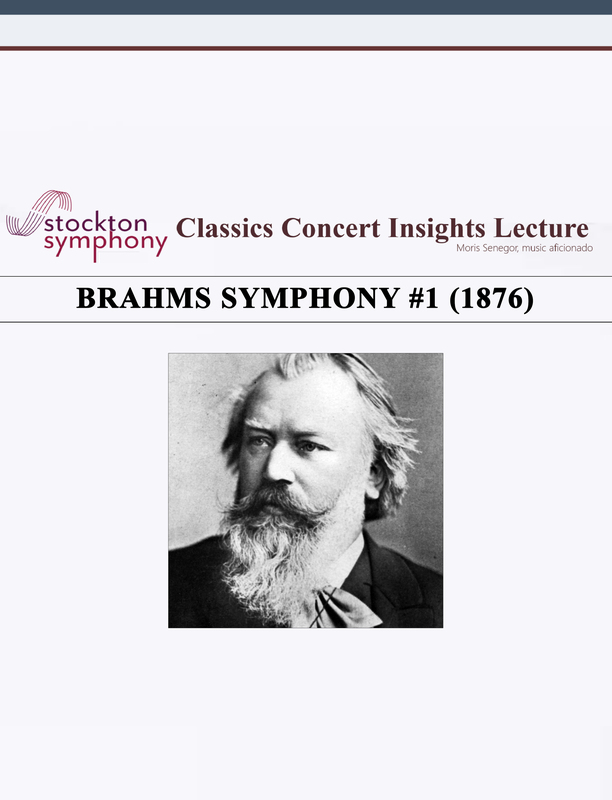 This Stockton Symphony Insights podcast is a detailed examination of a perennial classic that manages to maintain Brahms’ unique sound despite all his homages to Beethoven. Come and explore with me the history of this symphony, why it took him so long, and Brahms’ compositional style. I then explain every bit of the music. As a teenager studied piano with Marxsen; played in dance halls and brothels. 1853: Age 20. Musical tour with Reményi. Met Joseph Joaquim, violinist; became a lifelong friend. 1853: Joaquim introduced Brahms to Robert and Clara Schumann in Düsseldorf. Impressed with Brahms, Schumann became a mentor and father figure. Schumann published a superlative article about the young Brahms in Neue Zeitschrift fur Musik. 1854: Schumann attempted suicide; committed to an asylum in Endenich, near Bonn. Brahms came to Clara’s aide. Lifelong relationship, love between the two. 1859: Piano Concerto #1. It had begun as an attempt at a symphony. 1876: Symphony #1 (see “History of Symphony” below). 1897: Died in Vienna, age 63. 1853: Schumann, an influential composer and music critic, declared the young, unknown Brahms to be the successor of Beethoven. This set a high bar for the young, sensitive composer. Since Brahms did not leave any personal documents behind, the gestation of the work has been gleamed from letters by others. main theme of Movement I, date back to 1862. They were discovered second hand, in a letter from Clara Schumann to Joseph Joaquim. Brahms began work in earnest in 1874, after promising his publisher a symphony. “Off Broadway” premiere, November 4, 1876 in Karlsruhe, Baden, conducted by Otto Dessoff. Brahms subsequently revised the symphony, especially Movements 2 and 3. It received positive reviews and was immediately linked to Beethoven’s legacy. Once over the hurdle, Brahms composed three more symphonies: #2 (1877), #3 (1883), #4 (1885). Adhered to the structures and compositional techniques of the Classical Era. Brahms and Mendelssohn were the two main Classicists of the Romantic Era. Tightly composed works with thematic unity. Rhythmic drama. Continuous variation: Literal repetition kept to a minimum; re-statements of previously presented material subjected to variation. Continuous development: Musical material developed in the moment, not just in development sections. Blurred lines: Little or no musical cues between sections. This is decidedly non-Classical. A catharsis symphony, C-minor to C-major, as in Beethoven’s 5th. The catharsis moment evokes the Ode to Joy from Beethoven’s 9. Movements 1 & 4 are grand pillars; the inner two movements short intermezzi. Some scholars therefore consider the symphony to be of a three-part plan. Begins with an anguished outcry, forte (loud), in tutti (full orchestra). The outcry is a complex sound, thickly textured and polyphonic. It contains chromatic melodies that move in contrary motion. Violins and cellos present a rising 3-note idea (Motive A). At the same time winds and violas play a descending, 4-note idea (Motive B). A steady tympani beat adds to the tragic mood. Another line of music, heard prominently, is a C pedal in horns. The outcry becomes developmental and climaxes abruptly in a loud chord. Motives A & B are ur-motives that will give rise to many themes throughout the symphony. This polyphonic opening harkens back to Bach rather than Beethoven. Principle of continuous development is evident from the beginning. Quieter & lightly textured. Presents a variety of 2-note ideas, Motive C.
NOTE: 2-note ideas will be extremely prevalent in the symphony. Begins with C1-C2, antecedent-consequent phrases. C1: 2-notes in winds, with a long-long rhythm. Clock like pizz. accompaniment in strings. Repeats, sequenced down. C2: 2-notes in winds, with a long-short rhythm. C1-C2 repeated in variation: C1 in winds sequenced, C2 in strings extended. Transitional music: Diminuendo (quieting down) chromatic descent. Transitional music: Continues with C3, another 2-note idea, short-long. C3 is accompanied by the steady tympani beat of the outcry. It ends in an accelerating crescendo, in preparation for the return of the outcry. Outcry returns in variation, truncated. Motive A dominates, in winds, violins and cellos. Motive B in violas only. Tympani plays continuous roll, not steady beats. C pedal, still in horns. The variation hard to perceive. Outcry produces same emotional impact. If anything, the preceding interlude renders the variation more anguished. Motive C1 returns in a more lyrical, soothing passage. It is initially in oboe with horn accompaniment, then flute & cellos. Ends in a diminuendo chromatic descent. Music disintegrates. Music disintegrates and pauses, indicating end of Introduction. NOTE: This pause is one of the few clear demarcations in the symphony. The most important purpose of the Introduction is to present the three ur-motives of the symphony: A, B, & C.
In addition, the catharsis narrative is ushered with a decidedly anguished tone. Harkens back to the Intro of Beethoven’s 7th in its key area and meter. Composed as an afterthought. It was not in the first draft of the symphony he sent to Clara Schumann in 1862. Many scholars comment that without the Introduction, the beginning of the symphony would have been very abrupt. Begins with a C minor chord in orchestra. Theme I erupts as a stormy melody, fortissimo. The theme is not a tuneful melody. It is a jagged collection of motives. Its first phrase is derived from motives A & C (short-long). Its second phrase is a variation of the antecedent-consequent of Intro Part II. The consequent, C4 is a new idea, an extension of C3 (short-long). C4 will also be prevalent in the movement. The C2-C4 pair is repeated in variation, C4 extended. The theme is repeated in variation marked pesante (heavy & ponderous). Theme I complex ends in a closed cadence. 2-two-note motives in an assortment of different rhythmic profiles. Quiet transitional music, more 2-note motives, lead up to Theme II. Slower & quieter. Pastoral. A respite from the sturm-und-drang. First phrase: Begins in winds, descending 3-notes, an inversion of motive A. Continues in horns, developing ascending 3-note motive A derivative. Second phrase: Begins in winds, dolce & espressivo, derived from C1. Continues with Motive C5, long-short-short-long rhythm. Third phrase: Transitional passage in winds based on C5; slows and quiets. Troubled, stormy music returns fortissimo with incessant rhythmic drive. Begins with an ominous prelude that interrupts the pleasant mood of Theme II: two motive A derived triplets. Orchestra erupts with a new 4-note idea, an extension of motive A. Music continues with momentum, earlier motives (A, C3, C4) recalled. Loud Closing Theme in strings marked agitato; derived from motive C.
Closing Theme repeated in variation. Concludes with loud, 2-note motives alternating between strings and winds. Momentum continues, uninterrupted, into Development. In keeping with Classical tradition, Brahms calls for a repeat of the Exposition. Many conductors don’t. They straight to development. Peter Jaffe is one of them. Momentum of the Closing Section continues. Music climaxes with a key change from E-flat minor to B major. This is a calm section, with thin musical texture. Presents variations of 2-note motives (short-long) in winds. Music once again loud and stormy, initially repeating the Closing Section. Continues with juxtapositions of Closing Section &Theme I motives. Beethoven 5th Fate Motive rhythm is prominent and prevalent. Music calms, with winds developing the motive A.
Tympani accompanies, beating the Beethoven 5th Fate Motive rhythm. Ends with slowing tempo and diminishing music, as if it will end. A massive, stormy, tension filled end of Development. Monumental crescendo on motive A, in low strings with wind figurations. As the dynamics rise, the texture thickens. Loud horn fanfares blare out Beethoven’s ta-ta-ta-taaa (Fate Motive). Music reaches a sustained climax. At the height of the climax there is a raging polyphonic storm! Beethoven’s Fate Motive beats like a hammer, overlaid with Outcry motives. Tension rises to near impossible. Recapitulation is about to break out. Theme I is succinctly restated, in a truncated version. The pesante passage does not reappear. Bridge music is also truncated. Theme II is restated verbatim, but in C minor. Closing Section is repeated verbatim, also in C minor. NOTE: Recap is less than half the length of Exposition, atypical for the Classical Era. Momentum of Closing Section continues. 2-note ideas (short-short) are loudly tossed around the orchestra. The remainder of the Coda develops the A motive in two slow, lyrical sections. Music calmly fades away in strings in the key of C major. The brief, surprising appearance of C major foreshadows the finale. Overall C minor to C major narrative is the same as Beethoven’s 5th. Movement 1 is an entirely motivic construct in C minor, same as Beethoven’s 5th. Beethoven’s Fate Motive rhythm is pervasive in the Closing Sections and Development. The slow E flat Introduction in 6/8 meter, is the same as Beethoven’s 7th. Antecedent (a) in strings & bassoon, derived from motive A.
Consequent is a falling melody, derived from motive B. NOTE: Consequent (b) will serve as a cadential (concluding) gesture. After a brief crescendo, an expansive melody appears in strings. The melody features both ascending and descending gestures. It begins with a swell of descending gestures & continues lyrically, espressivo, with ascending gestures, toward a “b” cadence. A beautiful melody in oboe. This is an ornamented variation of a & b from the beginning. Quiet transitional music introduces a 2-note idea in strings. This will become an ostinato (recurring musical figure). The idea is in most of Section B, either in the surface or in accompaniment. Violins begin a lyrical melody over the ostinato. The melody rises, becomes loud & passionate & falls to a quiet conclusion. Solo oboe plays a pretty melody over a pulsating, sighing ostinato. Oboe melody is extended by clarinet. Quiet passage based on the “b” motive in winds. Music swells and a tragic impassioned episode occurs in strings. Music dies down in a quiet conversation between strings & winds. A’: Material presented in A returns in variation, ornamented and elaborated. Motives a & b in slightly extended variation. Returns in a duet between oboe & solo violin, both playing the same melody. Re-stated in a gorgeous passage, as a duet between horn and solo violin. The theme is in horn; violin plays a counter melody. A series 2-note gestures recall the ostinato of the middle section. Motive “a”, from the beginning stated slowly in violins over tympani rolls. Violins hold a high E note over concluding chords in winds. It is a sublime, peaceful conclusion to a movement that has provided a respite. Unlike Movement I, this is not a motivic construct. Brahms presents tuneful melodies. E major is a distant key from C minor. It brightens the mood of the symphony. Beethoven used the same C minor to E major plan in his Piano Concerto #3. This movement was extensively reworked by Brahms after the premiere of the Symphony. He converted it from Rondo to Ternary form. Ternary structure, A-B-A with a brief Coda. The music does not sound like its Classical counterparts, Minuet (or Scherzo) & Trio. Scholars prefer calling the A section Allegretto. The music features four phrases that run in somewhat symmetrical order. Phrase A (A-flat major), in clarinet, is a playful tune. Phrase A is an antecedent. It is derived from motive A. The second half of Phrase A is an exact inversion of the first. Phrase B is a consequent in winds with a skipping-hopping rhythm. Both phrases have a steady pizzicato accompaniment in strings. Variations of A & B, each extended. Phrase A’ is in violins, Phrase B’ is in winds. The steady string pizz continues to accompany. Phrase C is a sinuous clarinet melody that takes up only 4 measures. Phrase D is louder in winds and strings; derived from motive A. The accompaniments of C & D are more complex than those of A & B.
C’ is a variation of C using a motive from it, with strings in accompaniment. D’ is a broken up version of D, with a hesitant rhythm. It sounds transitional. Begins in clarinet as if the melody will be fully repeated. The melody breaks up after the main motive is stated and is slightly extended. The first Allegretto has its own internal ternary structure. The inner C & D phrases act like a contrasting Trio between the outer phrases. This is not a coincidence. Brahms has created a Russian doll-like arrangement within his greater plan. Traditionally Trio sections are quieter and lightly textured. This one is not. Its texture is thick and it is louder than the Allegretto. The Trio theme is a fanfare repeated thrice, with a short-short-long rhythm. Strings accompany with descending 3-note idea with the same rhythm. The Trio section is largely developmental, based on these two ideas. Ends with loud fanfares based on the Trio theme. Brief transitional music in pizz strings, 4-note stepwise descent. NOTE: This descent, derived from motive B, foreshadows Movement 4 Introduction. This is a variation of the original Phrase A. The main melody is still in clarinet & pizz strings still accompany. The second part of the melody is no longer an inversion of the first. It’s a new, more ornamented version of the original. Begins as in the original version. Continues developmentally, in a crescendo. Motives of phrases A, B & Trio theme are recalled in a passage marked poco a poco piu tranquillo (slower, calmer). The movement is very short, around 4 to 5 minutes. There is almost no literal repetition in the movement. Everything returns in variation. In two parts: Adagio and Più Andante. Quiet, chromatically descending 4-note melody in strings with tympani rolls sets a tragic mood. This 4-note idea is derived from motive B of Movement 1 Intro. Crescendo on a rising 3-note idea in strings and winds; it then descends. Tympani rolls continue. The rising 3-note idea is derived from motive A of the Movement I Intro. This section mirrors Movement I Intro, Part I. Music entirely made of 2-note rising and falling ideas as eighth-note pairs. The double notes increase in tempo in a crescendo that reaches a climax. The 2-note ideas are derived from motive C of Movement I Intro. This section mirrors Movement I Intro, Part II. In strings and winds. Shorter, louder & with loud tympani rolls. The music trails off tragically in strings. This section mirrors Movement I Intro, Part III. Another quiet pizz section with 2-note ideas in strings. Tempo again quickens amid a crescendo. This section mirrors Movement I Intro, Part IV. The 3-note rising idea quietly developed by winds. 2-note ideas developed, music rising in a crescendo. Brief climax, followed by two agitated passages of strings playing scales. Larger climax on 2-note ideas, initially in winds; horns join in, music loudest. Another climax with huge tympani roll. Music dies down in anticipation. Something important is about to happen. The Adagio can be considered a variation of Movement I Introduction. Its expressive purpose is to recall the anguish that began the symphony. The final agitated passage provides transition toward the catharsis. Solo horn states a noble melody, marked forte sempre e passionato (always loud & passionate), that Brahms labelled his Alphorn call. NOTE: This Alphorn call is one of the main themes of the movement. The Alphorn call is a smooth, four-square melody in two phrases, stated amid quiet tympani rolls. The horn call is derived from motives A & B of Movement I Introduction. Alphorn call is repeated by flute with tympani rolls. Pedal accompaniment in strings gives the music a hymn-like quality. This passage is also marked forte sempre e passionato. Trombones, horns and bassoons play a solemn chorale with dotted rhythms. NOTE: Pay attention to this hymn. It will reappear loud and glorious in the finale. Alphorn call repeated in variation, loud and ceremonious. First phrase sequences the 3-note rising motive in solo horn amid quiet tympani rolls. Second phrase begins with a crescendo in winds and horns and trails off to an open cadence. Once again, something important is about to happen. The Più Andante section can be viewed as having a small scale binary structure: A – A – B – A’. The Alphorn calls being A, and the hymn, B. The Alphorn call was an early idea in the birth of the symphony. Eight years earlier (1868) it was conceived by Brahms, inspired by the Alp horns of Switzerland, and sent to Clara Schumann. “Brahms rarely wrote introductions…But here we are treated to another introduction – two in the same symphony!” (Gene De Lisa). Movement 4 aims for a catharsis, transitioning from C-minor to C-major. In the Adagio, Brahms restates the gloomy C-minor mood of Movement 1, lost after the relatively peaceful intermezzi of Movements 2 & 3. The Più Andante with its remarkable Alphorn call, initiates the catharsis. As in Beethoven’s 5th, Brahms saves the trombone for the Fourth Movement. Version 1: Exposition begins with a new theme in violins with pizz string accompaniment. This melody is very similar to Beethoven’s Ode to Joy. The melody is thinly textured, mainly in strings. Version 2: The “Ode to Joy” melody repeated in winds, in a more richly textured passage with pizz strings, horns and tympani. Toward the end, Version 2 rises in a crescendo. NOTE: With the “Ode to Joy” the catharsis is fully realized. Begins fortissimo in tutti with the “Ode to Joy” motive and develops it in a passage marked animato (energetic). Brief reprise of Alphorn call in flute introduces Theme II complex. Quiet melody in strings derived from the 4-note descending motive that began the movement. The melody is developed in a crescendo passage. A similar melody in winds, also developed. NOTE: Theme II adheres to the Classical Era formula: subdued & dainty; in “correct” key, G major. This section features loud, energetic and agitated music. Agitated scales in strings rise in a crescendo. Closing theme: a syncopated melody full of dotted rhythms. Phrase structure: a – b – a’ – b’. a is made of short-long 2-note figures sequenced up and down. b is a syncopated 3-note rising idea. a & b form an antecedent-consequent pair. The first version of the Closing Theme is mainly in strings, loud. A second version presents a in solo oboe, with a tutti response, b’’. It is followed by a passage that develops a in winds. 2-note motives developed with multiple climaxes, including three massive orchestral chords. Ends in a closed cadence. Begins with a re-statement of the “Ode to Joy” in strings (C major). It is marked largamente (play with breadth) in the score. The melody is the same but the texture is thicker, with enhanced orchestration. “Ode to Joy” motives then developed in winds and horn. This return of “Ode to Joy” gives a false impression that the Exposition will repeat. It will not. In the remainder of the Development, Brahms utilizes various different fragments of the Ode theme and develops them. Mimics the fortissimo Modulating Bridge of the Exposition. It is an animated, stormy passage developing “Ode to Joy” motives. A brief wind interlude quietly develops a fragment of the Ode theme. The fragment is the 2nd-5th notes of the melody, rhythmically altered. NOTE: This wind interlude is a preview. It will return in a massive tutti version at the end of the Development. Begins with a loud, agitated, passage based on the first two notes of the Ode. The 4-note motive of the wind interlude returns, fortissimo and agitated, with massive orchestral chords on the last note. Tension builds up on loud statements of a 3-note motive from the Ode (2nd – 4th notes), with off-beat orchestral accents. Huge repetitions of 2-note motives lead to a massive climax. The music calms down on a preview of the Alphorn call as it transitions into Recap. NOTE: The agitated passages of this section, along with the huge climax and subsequent unwinding, all parallel the end of the Introduction that led to the first Alphorn Call. Now, the same will happen. The movement unexpectedly Recaps into the Alphorn call, loud in brass and strings with continuous tympani rolls. It is a truncated version of the original, but more ceremonious and noble. The Alphorn Call slows and dies down in a concluding passage. NOTE: The massive tension generated in Part IV of the Development is released and calmed by the Alphorn Call recap. Theme II complex returns as in the Exposition and, in keeping with the Classical prescription, in C major, the home key. The entire Closing Section also returns as in Exposition, in C major. Music harkens back to the movement’s Introduction. Quiet 2-note motives in cannon between winds and strings bring back an ominous mood. This mood is emphasized with rising music, the 2-notes louder in winds, horns & low strings with tympani rolls. Music rises to a climax. In a passage marked stringendo (press forward, accelerate) the ominous mood is wiped out, as music accelerates in a galloping rhythm. This ushers in the Più Allegro; music based on the 3 note fragment of the Ode (2nd – 4th notes) rushes on, still galloping. The hymn like chorale heard amid the original Alphorn Calls returns, fortissimo in brass. Music rushes on, loud and energetic. Fortissimo unison statement by full orchestra, amid loud tympani rolls, brings back the 4-note descending idea that started the movement in C minor. The 4-note motive is rhythmically altered, resplendent in its C major glory and difficult to recognize for the morose melody it was when first heard. The motive stated three times. Huge orchestral chords follow, then a bit more rollicking, galloping music and final loud, triumphant concluding chords. For Brahms, the Classicist, the fourth movement’s Sonata Form structure differs from the Classical model in the way it treats the Alphorn Call and “Ode to Joy” melodies interchangeably as the main theme. “Perhaps no other work was achieved so painfully, and with so oppressive a sense of responsibility to the history of its genre; but it was labor supremely well spent.” Malcolm Mac Donald. Hans von Bülow, influential conductor in the late 19th century, called Brahms Symphony #1, “Beethoven’s Tenth.